We are pleased to announce the 2018 cohort of our Welcoming Communities Transatlantic Exchange. 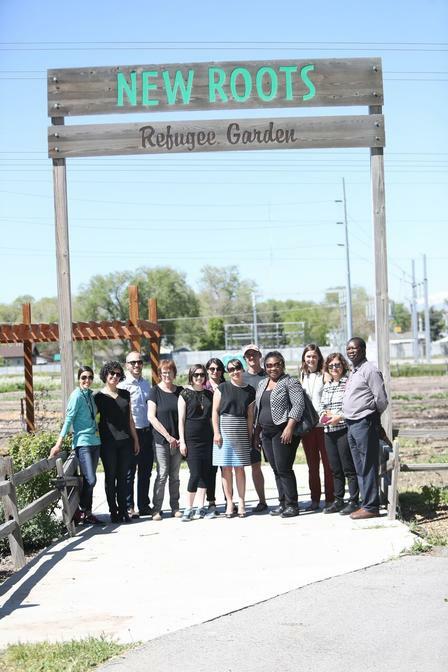 This professional exchange program annually convenes over 40 professionals from the United States and Germany to share best practices and learn from one another about the reception and integration of immigrants and refugees at the local community level. A main focus of the program is to strengthen communication with receiving communities and to foster strong local networks to better welcome newcomers. Each community is represented by a team of local government officials; refugee resettlement agencies; and civil society, business, and faith leaders who work on integration issues at the local level. The teams were competitively selected based on the integration challenges that their communities face, the quality of existing welcoming strategies, and a demonstrated eagerness to discover new ideas, share best practices, and develop innovative approaches through transatlantic dialogue. Each team is expected to design and implement new welcoming initiatives following their participation in the program. A 10-day visit to the US in April will provide the German city-teams a wide-ranging look into how US cities welcome and integrate newcomers. The group will receive an orientation on US federal immigration, asylum, and integration policies in Washington, D.C. and will participate in site visits and meetings with their integration practitioner counterparts in the participating US cities. In November, the WCTE participants from the US will conduct a return visit to Germany. In addition to local site visits with their German peers, the group will convene in Berlin for a final conference with alumni of previous cohorts. US delegates will receive a federal overview, assess lessons learned from the trip, and share strategies for the application of welcoming initiatives in both countries. The Welcoming Communities Transatlantic Exchange is administered by Cultural Vistas, in collaboration with Welcoming America and the Heinrich Böll Foundation North America. The project is funded by the Transatlantic Program of the Federal Republic of Germany, with support from the European Recovery Program of the Federal Ministry for Economic Affairs and Energy, as well as by the US Department of State, the Robert Bosch Stiftung, the Heinrich Böll Stiftung and the BMW Group. Announcing the 2017 Transatlantic Welcoming Communities! We are pleased to announce the nine communities that will participate in our 2017 Welcoming Communities Transatlantic Exchange. Our ‪#‎hbsMigration‬ study tour participants on Germany, immigrant integration, and why they still believe in the American dream.